Local residents must be feeling like the fans of a successful sports team after the last six weeks of Cape Town weather: There has been a constant stream of victories in the battle against day zero. Where do we start? May has been ludicrously kind to the region, with six different cold fronts lashing the Western Cape during recent weeks. Many areas have easily surpassed their monthly averages, and there is much more to come. We don’t do hyperbole, here. 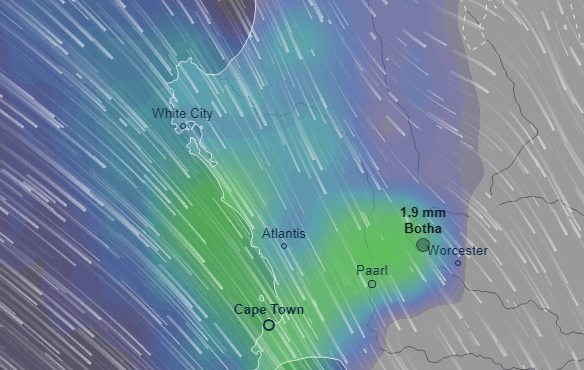 But we have to say, the rainfall forecast shared by Ventusky will have some Capetonians considering how to build themselves an ark. Monday saw a deluge of rain batter Cape Town, and the province itself. 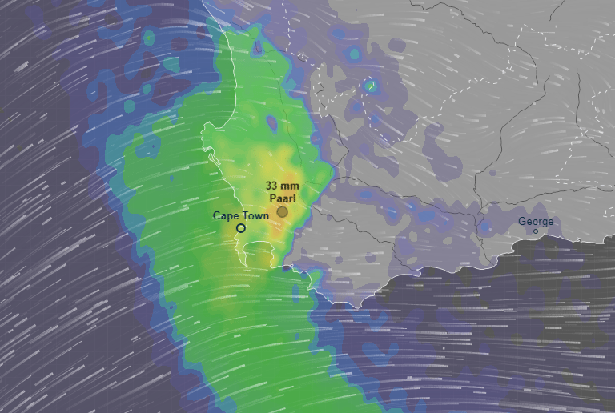 20 – 35mm has fallen across the Western coast, following up from Sunday’s intermittent showers. On Tuesday, the rain will persist in bursts throughout the day. 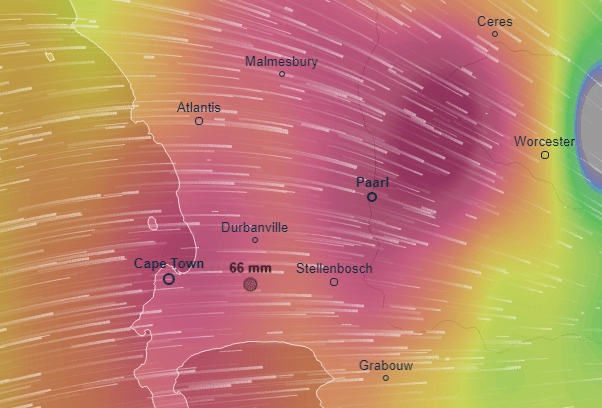 There’s slightly more joy in the eastern parts of the Cape, but the Mother City and its municipality – as well as northern coastal regions – will take in another 8-10mm. Wednesday is a relatively dry day, with a few spits and spots in sporadic locations. However, don’t take this as a sign that things are clearing up. On any other day, we’d be hailing this predicted precipitation as the best the region could hope for. The rain makes its way in from the west by around 11:00. Determined showers and patches of driving rain make on-and-off appearances during the day. Get your buckets ready, your coats to hand and hatches thoroughly battened down. The figures we’re seeing defy belief. Yet here they are, pouring down from open heavens. Villiersdorp – home to Theewaterskloof dam – is forecast to receive 15mm of rain overnight. Both Steenbras dams are expected to take in 20mm, whereas Clanwilliam is on course for a respectable 11.5mm. Again, it’s a good effort. 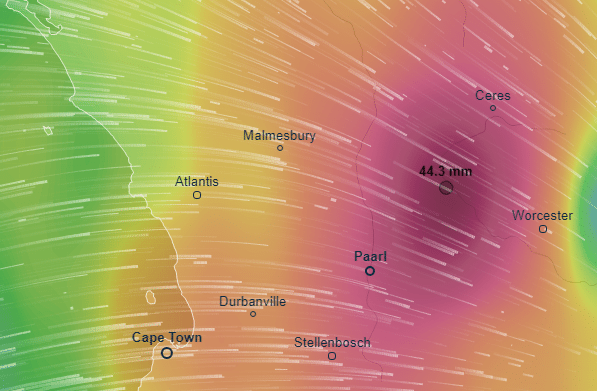 Yet it will be the regions between Paarl and Worcester that see the most rain. Residents are on course for almost 70mm rainfall in just one evening. Given that the monthly average is 70mm, we don’t have to tell you just how torrential this storm will be. Whilst there will be relief for a parched province, weather warnings are poised to be handed out for the affected areas.